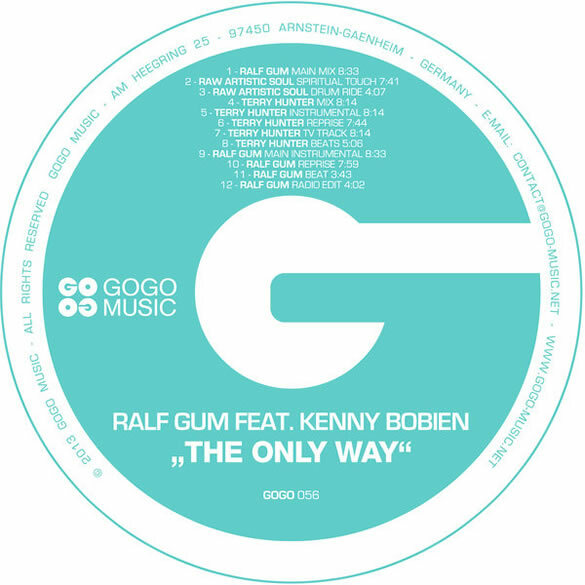 GOGO Music presents you with this single the tight collaboration of Ralf GUM and Kenny Bobien. ‘The Only Way’ is taken from Ralf’s long-player Never Leaves You and urged for powerful remixers which we found with Raw Artistic Soul and Terry Hunter, who both deliver great treatments to complete this fine release. Ralf GUM became an uncontested top artist in the soulful House scene, since he started his musical career in 1990 and goes from strength to strength. Lately he set another milestone on his path, with a Gold award, which was bestowed on his artist album Never Leaves You in South Africa. The Only Way is taken from and following up the highly successful extractions from the long-player. These include already several hit singles, one of them Take Me To My Love which was undoubtedly one the biggest house anthems in 2012 and hit #1 in the official South African charts. New Jersey’s Kenny Bobien is one of the most widely recognized male singers in House and is often referred to as the King of Gospel House Music. His distinctive falsetto has powered many club anthems and his recordings simply are an impressive string of quality releases that have inspired many. He connected with Ralf after his remix for Dance Culture feat Kenny Bobien Better and blessed his album with 2 songs, one of them the new single out now The Only Way. Raw Artistic Soul does, for those who follow GOGO Music and the House Music scene in general, not need much of an introduction anymore. The untouchable studio master set several innovative musical landmarks with his releases since his first offering titled The One Cultural Groove in 2004. His remix of the song is a reduced Beat and Vocal workout, yet a very spiritual vision of the song. Legendary Terry Hunter completes the mixes with his classic touch. He gained his reputation as a well known producer and remixer with countless works, including mixes for major artists such as Michael Jackson, Dina Carroll, Mary J. Blige, Brownstone and India. The Chicago native is an integral part of its scene and one who helped shaping it as we know it today.